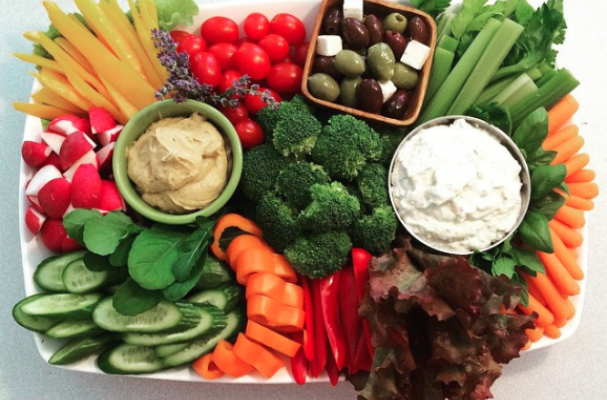 Crudite platters have been making a comeback in a big way. Restaurants are serving up platters of raw farmer's market vegetables with well flavored sauces that are far from the cauliflower-carrot-broccoli-ranch dip fare that most American are accustomed to. They have morphed into something of a combination of the classic French crudite and an Italian antipasto with cured and pickled things thrown into the mix. With that being said, most Super Bowl parties need a vegetable platter to help balance the bowls of chili, slices of pizza and plates of chicken wings. Instead of buying something pre-packaged at the grocery store, I challenge you to assemble your own new age crudite platter. The assortment of brightly colored vegetables paired with an internationally flavored condiment is guaranteed to draw eaters in to devour this update version of a classic appetizer. Step 1: In a small skillet, heat oil over medium high heat. Add the torn pieces of bread and whole natural almonds and toast for 2 – 3 minutes until the bread starts to turn golden brown. Once toasted, let the mixture cool. Transfer the entire content of the skillet to a high-powered food processor or blender. Add drained red bell peppers, vinegar, paprika, garlic and parsley and pulse for 2 minutes until smooth. Taste and season with salt and pepper as needed. Pulse to combine. Serve with assorted fresh, sliced vegetables as a dip. Step 1: Puree both vinegars, onions, parsley, anchovies, garlic, salt, and lemon juice in a blender until well combined. Blend in mayonnaise and serve.